Crimsonheart Castle is a theme dungeon accessible to players from levels 130+ by starting Grendel's first few quests, and then accessing via the Dimensional Mirror. 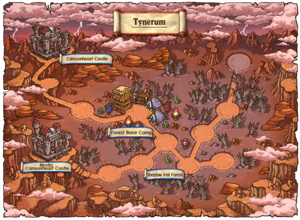 The area of Tynerum is accessible from here. Grendel received a message from the Crimsonheart Castle in Tynerum and wants you to figure out what's happening. While there, you find that there are 12 demons trapped in the castle waiting to be sacrificed. You find out from a talking statue, Ridley, that it is up to you to rescue the demons, and you must save them by killing monsters to clear a path out of the castle. While doing these quests, you will also have to complete several mini-games to access the next area after completing one. The first mini-game, Ghost Sniper, involves you having to aim your mouse at Jr. Wraiths that fade in and out, and click to shoot and eliminate them. The second mini-game, Castle Climb, involves climbing to the top of the map while avoiding falling meteors and purple lights that can stun, and clicking on the box at the top of the map. The third mini-game, Untrappable, involves a jump quest filled with totem poles, falling Stirges, and several other obstacles. On the way, you can open boxes to obtain fragments for the last item you need, a Night Mark (100 fragments are needed), or you can open the box at the end of the jump quest to obtain a complete Night Mark. Grendel the Really Old will contact you via lightbulb. Talk to Grendel. He will transport you to Ellinia : Magic Library. Grendel the Really Old at Ellinia : Magic Library. Take the Dimensional Mirror to Crimsonheart Castle : Top of the Citadel. Pepper at Crimsonheart Castle : Top of the Citadel. Ridley at Crimsonheart Castle : Top of the Citadel. Accept the quest from yourself, where Grendel will contact you. Kill 100 Typhons and 100 Elite Stormbreakers. Kill 130 Leprechauns and 130 Elite Firebrands. Kill 160 Elderwraiths and 160 Elite Windraiders. Kill 200 Crimson Stirges and 200 Elite Nightshadows. Talk to Grendel via the quest from yourself. Enter the bottom right portal and defeat Master Red Nirg. Click the quest above you. Kill 250 Elite Scarlet Phoenix and Elite Azure Ocelot. Enter the portal directly to the right of Ridley to complete the mini-game Ghost Sniper. Defeat all the Jr. Wraiths within the time limit, using the mouse to aim. Enter the portal directly to the right of Ridley to complete the mini-game Castle Climb. Climb to the top while avoiding obstacles, and click on the box at the top of the map to obtain Wind Mark. Enter the portal directly to the right of Ridley to complete the mini-game Untrappable. Complete the jump quest while avoiding the Menhirs (totem poles), falling Stirges, and other obstacles. Open the boxes along the way to obtain Night Mark Fragments (100 are needed to make a complete one), OR open the last box to obtain the Night Mark. This page was last edited on 30 December 2018, at 19:38. This page has been accessed 108,126 times.